She’s ready for the big time, ready for the small — whatever’s comin’ to us, we’ll be ready for it all! After months and years of waiting, pop princess Hilary Duff is returning to us with her brand new single next week. 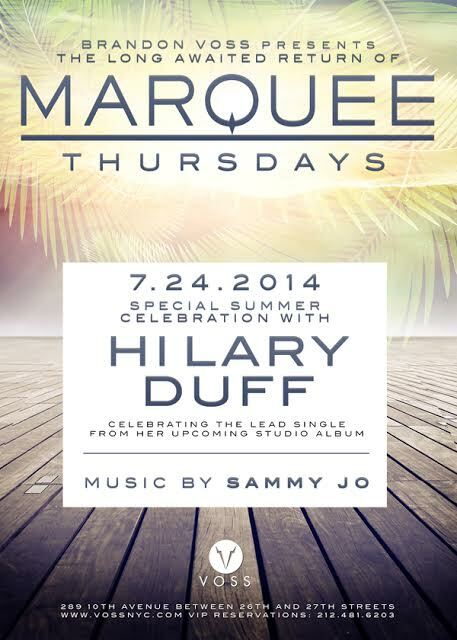 According to a flyer posted last night, Duff will premiere the lead single from her forthcoming album live at Marquee in NYC next Thursday, July 24. “World Debut of the Lead Single from her New Studio Album!,” the official Facebook event declares. Little Duffsters from all around the world, start booking your flights to JFK now! We remain on constant #DuffWatch. Check out the flyer after the jump. Are you excited for the return of Hilary? Let us know what you think in the comments below.